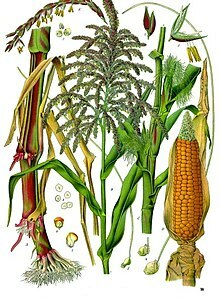 Maize (Zea mays), kent as (Indian) corn an aw, is a herbaceous plant domesticatit in Mesoamericae that syne spreid athort the American continents. Efter European contact wi the Americaes in the late 15t an early 16t centuries, maize spreid tae the lave o the warld. Wikimedia Commons haes media relatit tae Corncobs.